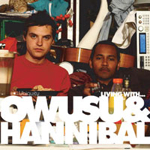 Anything without 2008 on the release date is old, but that doesn’t matter… Owusu & Hannibal have the cure. Low Motion Disco stay true to their name. But the LMD debut EP is now delayed until… nobody knows… and they continue to keep an frustratingly-low profile. There are a minimal number of places to check out their musics… their label doesn’t even mention the release that was suppose to come out today. Grrr… I look forward to it anyway. I get like that. Low Motion Disco “Low In the City”. what? does not one else care, how cool it is that O&W have an akai s2000 in the background on their cover? only me? !